Whenever Verklärte Nacht is mentioned, musicians always have this strange, immediate reaction. It’s a curious mixture of dread, intimidation, and starry-eyed adoration. I’m at a loss trying to think of another work that inspires the same feeling! The dread comes, I suppose, from the technical difficulty of the parts and demanding ensemble work. Trying to match chromatic flourishes, sometimes awkward rhythmic motives, and the intonation of constantly modulating harmony in a unified and precise way can be challenging. The intimidation lies in the scope of the work. This was arguably the first tone-poem composed for a chamber ensemble, and the emotional range is huge. Imagine trying to play a Strauss tone-poem with just six stringed instruments! Transfigured Night was an early work by Arnold Schoenberg, a composer who later created the twelve-tone system of composition. The inspiration for this work came from a poem of the same name by the German poet Richard Dehmel. Schoenberg illustrates the emotional states behind the poetry, and the sextet must create larger-than-life atmospheres in order to be properly expressive. “Look, how brightly the universe shines! …which Schoenberg beautifully captures with music. As you can guess, the first part of the tone poem is filled with darkness and anguish and the second with luminous, incredibly beautiful music. 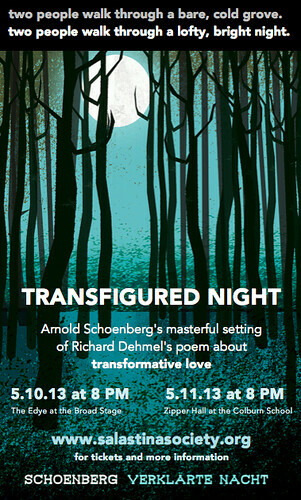 Schoenberg literally transfigures themes from the first part to become the music of the second. This is what we’ll be demonstrating and performing this weekend, May 10-11 in the Los Angeles area, with KUSC radio host Brian Lauritzen acting as emcee for the concert. We have some wonderful musicians joining us, including the principal cellist of LACO (former princ. of Philharmonia Orchestra and LA Philharmonic), the assistant principal violist of the Pacific Symphony, and other stellar artists. If you’re interested, use the code “fbfriend” (without quotes) during the online purchase process for $15 tickets! I'd say your description of one's reaction the V.N. sums up mine perfectly. Despite playing sextets quite a lot this is one that doesn't get tackled very often in the amateur circles I travel in. My one opportunity came when I was assigned to a 6tet at a chamber music workshop. In the week leading up to the workshop the group tried to decide on what piece to play. The other violinist suggested VN..... and they'd take second. Given the non-existent preparation time, I had to decline, but I did print out the part & score (all parts available @IMSLP.. btw) and followed along with the recording. It's definitely a piece I'd like to get more familiar with. I'm sure your performance will be wonderful. Thanks Christina! It looks like Schoenberg's son will be in the audience tonight, so we'll have to triple check our talking points. I imagine that getting together for a casual reading of VN would probably not be too productive - even rehearsing it for the first time with people familiar with the work can be messy. At the same time, it's so worth getting to know the music regardless of the setting. Boulez's Ensemble Intercontemporain, Chamber Music Society of Lincoln Center (on youtube), Hollywood String Quartet plus guests. I heard Janine Jansen also has a nice version out.